All Star Flags has a high-quality Marine flag for sale here! Our Marine flags are fully dyed for great outdoor performance. Four rows of stitching on the fly end make our US Marine Flags durable in all conditions. USMC Flags are finished with a canvas header and two brass grommets. We only have American-made Marine flags for sale here. In full parade form, the official US Marine Corps flag measures 4 feet 4 inches hoist by 5 feet 6 inches fly and is trimmed with 2.5 inch gold fringe. The dress form of the Marine flag is perhaps the most visually stunning of all the service flags. It is a scarlet flag with the Marine Corps Emblem in gray and gold, and bordered by a gold fringe. Battle streamers (long strips that commemorate achievements in military encounters) adorn the top, and the flag must be carried by the Color Sergeant, a man stipulated to be at least 6 foot 4 inches tall (he also serves as the bearer of the Flag of the President of the United States at state dinners). The Corps emblem bears an eagle on a globe before an anchor, and the Latin Inscription "Semper Fidelis"--Always Faithful. The dominate colors of the the USMC flag are the scarlet and gold, the official colors of the Marine Corps. The Marine Corp emblem features a grey globe with gold continents that sits atop a fouled gold anchor. A spread eagle (American symbolism) sits atop the globe with the Semper Fidelis inscribed on a ribbon extending from the eagle's beak. A white flowing scroll is beneath the Marine Corps emblem and contains the organization name in scarlet lettering: "United States Marine Corps." The early history of the USMC flag is limited. It is believed that the earliest of battalions carried the Grand Union and other revolutionary flags. A white flag with gold fringe and the introduction of an anchor and eagle design started appearing in the 1830's. Versions of this flag featured the slogans "To the Shores of Tripoli” and then later "From Tripoli to the Halls of the Montezumas." In the mid-1800's, during the Mexican War and Civil War, the Marine Flag was very similar to the National Flag. The flag had alternating red and white stripes with a union. The union contained a perched eagle on a shield of the S and a half a wreath below the shield with 29 stars circling the design. In the late 1800's, the Marines carried the National Flag with an alteration that had "US Marine Corps" in yellow lettering on the middle red stripe. In the early 1900's a new USMC flag design was carried that had a blue field with a laurel wreath surrounding the Corps emblem. A scarlet ribbon was above the emblem reading "US Marine Corps" and an additional scarlet ribbon was beneath the emblem reading "Semper Fidelis." This design evolved into the current Marine Flag that was officially adopted in 1939 and is still in use today. All Star Flags has the official Marine flag for sale here! 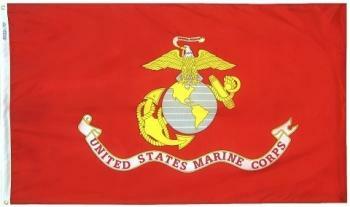 Marine Garden Flag - Nylon - 12x18"